Announcing the winners of the 52nd ever Right Place Photo Caption Contest! Thank you to one and all who participated throughout all of our first season! Presenting the top 30 captions for this picture from AFP/KCNA/File via Yahoo! -- None of his aides dared mention that Kim Jong-Il could not do the Spock hand signal, as he exclaimed, "Rive Rong and Plosper" at the first NoKo Trekkie convention. -- "I am... Captain CRAZY!!!!!!" -- AT LEFT: Kim Jong-Il's little brother, Kim Jong-Not-Feeling-So-Good-Myself, models his famous collection of taxi cab medallions. -- "Hi! I wanna give a shout-out to all my peeps in the gulags! You keep on slavin'!" -- "You say famine, I say skinny..."
-- Two new animatronic characters have been added to Disneyland's "It's A Small World" attraction: Little Kimmy Crackpot and his sidekick, General Mayhem. -- No wonder Kim Jong-Il can't see the devistation he's wrought in North Korea. He's wearing rose-colored glasses. -- After seeing this inspiring photo, Cindy Sheehan changes her one-way plane ticket from Venezuela to North Korea. -- The crowd cheered every time they got Kim to say - "Nucrear Proriferation"
-- The Little General gives everyone the sign that it is now time to drink the Kool-Aid. -- Kim celebrates his win at the annual Robot Dance-Off. -- Kim "Elton" Jong-II accepts a nomination for the Nobel Peace Prize for his role in not starting a nuclear war in the region. -- In a major fashion faux pas costing a handler his life, Kim showed up for the Axis of Evil summit in a simple tunic from the "Genocidal Dictator" line by Giorgio Armani with overstated and oversized "eye opener" shades from Louis Vuitton. -- "Hellooooo! Over here! Still got nukes. Still shooting missles. Hello! Anyone? Hello?" -- "I'm open! Throw me the g*ddamn ball!" #10: "Da plane, da plane!!!" #9: RUMSFELD (off camera): "Okay, who's next?" #8: "Dees new grasses make my missoos rook so big!" #7: Who's that behind those Foster Grants? #6: "They call them missiles because they all miss!" #5: Kim Jong-Il's high fives were really low fives for everyone else. #4: Kim Jong-Il's red right hand demonstrates that he has also recently launched the "Type-o-Dong 2 1/2." 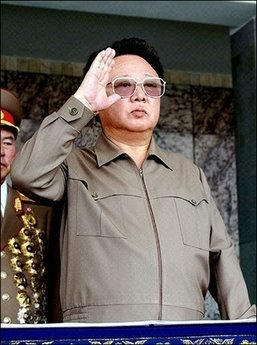 #3: Kim Jong-Il salutes the multitudes of cheering fans after his record 47 at the Masters. #2: The last photograph of Kim Jong-Il, as North Korea launched its unique "boomerang" missile. That would shoot off nukes at his brother man? Who won't give back the Chinese trains? But, I'm just talkin' about Il! Paris Hilton called, she wants her "look" back. COMING SOON: CapHOG Update, Season One Championship Edition!